The Nez Perce tribe of Indians, like other tribes too large to be united under one chief, was composed of several bands, each distinct in sovereignty. It was a loose confederacy. Joseph and his people occupied the Imnaha or Grande Ronde valley in Oregon, which was considered perhaps the finest land in that part of the country. He had a long council with Joseph and his leading men, telling them they must obey the order or be driven out by force. We may be sure that he presented this hard alternative reluctantly. Joseph was a mere youth without experience in war or public affairs. He had been well brought up in obedience to parental wisdom and with his brother Ollicut had attended Missionary Spaulding's school where they had listened to the story of Christ and his religion of brotherhood. He now replied in his simple way that neither he nor his father had ever made any treaty disposing of their country, that no other band of the Nez Perces was authorized to speak for them, and it would seem a mighty injustice and unkindness to dispossess a friendly band. General Howard told them in effect that they had no rights, no voice in the matter: they had only to obey. Although some of the lesser chiefs counseled revolt then and there, Joseph maintained his self-control, seeking to calm his people, and still groping for a peaceful settlement of their difficulties. He finally asked for thirty days' time in which to find and dispose of their stock, and this was granted. Joseph steadfastly held his immediate followers to their promise, but the land-grabbers were impatient, and did everything in their power to bring about an immediate crisis so as to hasten the eviction of the Indians. Depredations were committed, and finally the Indians, or some of them, retaliated, which was just what their enemies had been looking for. There might be a score of white men murdered among themselves on the frontier and no outsider would ever hear about it, but if one were injured by an Indian—"Down with the bloodthirsty savages!" was the cry. Joseph told me himself that during all of those thirty days a tremendous pressure was brought upon him by his own people to resist the government order. "The worst of it was," said he, "that everything they said was true; besides"—he paused for a moment—"it seemed very soon for me to forget my father's dying words, 'Do not give up our home!'" Knowing as I do just what this would mean to an Indian, I felt for him deeply. Among the opposition leaders were Too-hul-hul-sote, White Bird, and Looking Glass, all of them strong men and respected by the Indians; while on the other side were men built up by emissaries of the government for their own purposes and advertised as "great friendly chiefs." As a rule such men are unworthy, and this is so well known to the Indians that it makes them distrustful of the government's sincerity at the start. Moreover, while Indians unqualifiedly say what they mean, the whites have a hundred ways of saying what they do not mean. However, the whites were unduly impatient to clear the coveted valley, and by their insolence they aggravated to the danger point an already strained situation. The murder of an Indian was the climax and this happened in the absence of the young chief. He returned to find the leaders determined to die fighting. The nature of the country was in their favor and at least they could give the army a chase, but how long they could hold out they did not know. Even Joseph's younger brother Ollicut was won over. There was nothing for him to do but fight; and then and there began the peaceful Joseph's career as a general of unsurpassed strategy in conducting one of the most masterly retreats in history. The main plan of campaign was to engineer a successful retreat into Montana and there form a junction with the hostile Sioux and Cheyennes under Sitting Bull. There was a relay scouting system, one set of scouts leaving the main body at evening and the second a little before daybreak, passing the first set on some commanding hill top. There were also decoy scouts set to trap Indian scouts of the army. I notice that General Howard charges his Crow scouts with being unfaithful. Their greatest difficulty was in meeting an unencumbered army, while carrying their women, children, and old men, with supplies and such household effects as were absolutely necessary. Joseph formed an auxiliary corps that was to effect a retreat at each engagement, upon a definite plan and in definite order, while the unencumbered women were made into an ambulance corps to take care of the wounded. It was decided that the main rear guard should meet General Howard's command in White Bird Canyon, and every detail was planned in advance, yet left flexible according to Indian custom, giving each leader freedom to act according to circumstances. Perhaps no better ambush was ever planned than the one Chief Joseph set for the shrewd and experienced General Howard. He expected to be hotly pursued, but he calculated that the pursuing force would consist of not more than two hundred and fifty soldiers. He prepared false trails to mislead them into thinking that he was about to cross or had crossed the Salmon River, which he had no thought of doing at that time. Some of the tents were pitched in plain sight, while the women and children were hidden on the inaccessible ridges, and the men concealed in the canyon ready to fire upon the soldiers with deadly effect with scarcely any danger to themselves. They could even roll rocks upon them. In a very few minutes the troops had learned a lesson. The soldiers showed some fight, but a large body of frontiersmen who accompanied them were soon in disorder. The warriors chased them nearly ten miles, securing rifles and much ammunition, and killing and wounding many. The Nez Perces next crossed the river, made a detour and recrossed it at another point, then took their way eastward. All this was by way of delaying pursuit. Joseph told me that he estimated it would take six or seven days to get a sufficient force in the field to take up their trail, and the correctness of his reasoning is apparent from the facts as detailed in General Howard's book. He tells us that he waited six days for the arrival of men from various forts in his department, then followed Joseph with six hundred soldiers, beside a large number of citizen volunteers and his Indian scouts. As it was evident they had a long chase over trackless wilderness in prospect, he discarded his supply wagons and took pack mules instead. But by this time the Indians had a good start. Meanwhile General Howard had sent a dispatch to Colonel Gibbons, with orders to head Joseph off, which he undertook to do at the Montana end of the Lolo Trail. The wily commander had no knowledge of this move, but he was not to be surprised. He was too brainy for his pursuers, whom he constantly outwitted, and only gave battle when he was ready. There at the Big Hole Pass he met Colonel Gibbons' fresh troops and pressed them close. He sent a party under his brother Ollicut to harass Gibbons' rear and rout the pack mules, thus throwing him on the defensive and causing him to send for help, while Joseph continued his masterly retreat toward the Yellowstone Park, then a wilderness. However, this was but little advantage to him, since he must necessarily leave a broad trail, and the army was augmenting its columns day by day with celebrated scouts, both white and Indian. The two commands came together, and although General Howard says their horses were by this time worn out, and by inference the men as well, they persisted on the trail of a party encumbered by women and children, the old, sick, and wounded. It was decided to send a detachment of cavalry under Bacon, to Tash Pass, the gateway of the National Park, which Joseph would have to pass, with orders to detain him there until the rest could come up with them. Here is what General Howard says of the affair. "Bacon got into position soon enough but he did not have the heart to fight the Indians on account of their number." Meanwhile another incident had occurred. Right under the eyes of the chosen scouts and vigilant sentinels, Joseph's warriors fired upon the army camp at night and ran off their mules. He went straight on toward the park, where Lieutenant Bacon let him get by and pass through the narrow gateway without firing a shot. However, this succession of defeats did not discourage General Howard, who kept on with as many of his men as were able to carry a gun, meanwhile sending dispatches to all the frontier posts with orders to intercept Joseph if possible. Sturgis tried to stop him as the Indians entered the Park, but they did not meet until he was about to come out, when there was another fight, with Joseph again victorious. General Howard came upon the battle field soon afterward and saw that the Indians were off again, and from here he sent fresh messages to General Miles, asking for reinforcements. It is the general belief that Indians are cruel and revengeful, and surely these people had reason to hate the race who had driven them from their homes if any people ever had. Yet it is a fact that when Joseph met visitors and travelers in the Park, some of whom were women, he allowed them to pass unharmed, and in at least one instance let them have horses. He told me that he gave strict orders to his men not to kill any women or children. He wished to meet his adversaries according to their own standards of warfare, but he afterward learned that in spite of professions of humanity, white soldiers have not seldom been known to kill women and children indiscriminately. The Bittersweet valley, which they had now entered, was full of game, and the Indians hunted for food, while resting their worn-out ponies. One morning they had a council to which Joseph rode over bare-back, as they had camped in two divisions a little apart. His fifteen-year-old daughter went with him. They discussed sending runners to Sitting Bull to ascertain his exact whereabouts and whether it would be agreeable to him to join forces with the Nez Perces. In the midst of the council, a force of United States cavalry charged down the hill between the two camps. This once Joseph was surprised. He had seen no trace of the soldiers and had somewhat relaxed his vigilance. He told his little daughter to stay where she was, and himself cut right through the cavalry and rode up to his own teepee, where his wife met him at the door with his rifle, crying: "Here is your gun, husband!" The warriors quickly gathered and pressed the soldiers so hard that they had to withdraw. Meanwhile one set of the people fled while Joseph's own band entrenched themselves in a very favorable position from which they could not easily be dislodged. He had believed that his escape was all but secure: then at the last moment he was surprised and caught at a disadvantage. His army was shattered; he had lost most of the leaders in these various fights; his people, including children, women, and the wounded, had traveled thirteen hundred miles in about fifty days, and he himself a young man who had never before taken any important responsibility! Even now he was not actually conquered. He was well entrenched; his people were willing to die fighting; but the army of the United States offered peace and he agreed, as he said, out of pity for his suffering people. Some of his warriors still refused to surrender and slipped out of the camp at night and through the lines. Joseph had, as he told me, between three and four hundred fighting men in the beginning, which means over one thousand persons, and of these several hundred surrendered with him. His own story of the conditions he made was prepared by himself with my help in 1897, when he came to Washington to present his grievances. I sat up with him nearly all of one night; and I may add here that we took the document to General Miles who was then stationed in Washington, before presenting it to the Department. The General said that every word of it was true. In the first place, his people were to be kept at Fort Keogh, Montana, over the winter and then returned to their reservation. Instead they were taken to Fort Leavenworth, Kansas, and placed between a lagoon and the Missouri River, where the sanitary conditions made havoc with them. Those who did not die were then taken to the Indian Territory, where the health situation was even worse. 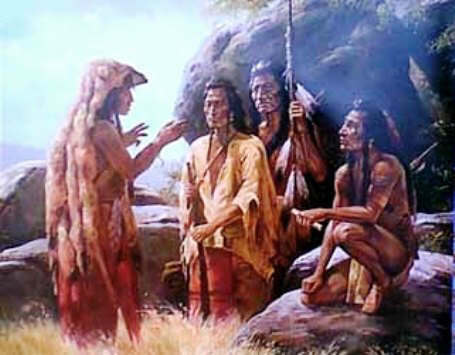 Joseph appealed to the government again and again, and at last by the help of Bishops Whipple and Hare he was moved to the Colville reservation in Washington. Here the land was very poor, unlike their own fertile valley. General Miles said to the chief that he had recommended and urged that their agreement be kept, but the politicians and the people who occupied the Indians' land declared they were afraid if he returned he would break out again and murder innocent white settlers! What irony! The great Chief Joseph died broken-spirited and broken-hearted. He did not hate the whites, for there was nothing small about him, and when he laid down his weapons he would not fight on with his mind. But he was profoundly disappointed in the claims of a Christian civilization. I call him great because he was simple and honest. Without education or special training he demonstrated his ability to lead and to fight when justice demanded. He outgeneraled the best and most experienced commanders in the army of the United States, although their troops were well provisioned, well armed, and above all unencumbered. He was great finally, because he never boasted of his remarkable feat. I am proud of him, because he was a true American. This story of Chief Joseph is featured in the book entitled Indian Heroes and Great Chieftains by Charles A. Eastman which was published by Little, Brown and Company, Boston in 1918.